Kitty, I love how you've decorated your home. Everything from the welcoming door basket to the delicious looking pumpkin muffins says fall. It's darling. I love your fall decor. The box from your husband is just so special. That scarecrow on the gate is too stinking cute. What a great idea. Thanks for joining this tour. Your home is beautifully decorated for autumn! I love the homemade box on your dining room table that you are able to decorate seasonally. And I even enjoyed seeing the Blessings mug...just an inexpensive one from Wal*Mart that year, but it certainly fits right in to the current decor. Beautiful and homemade chicken noodle soup sounds really good about now. So many nice details I love this and the best part about fall in Texas you can finally sit outside again. Hi Kitty and your home looks so nice all falled up! Your little basket on your front door is just darling! Everything looks so pretty and cozy. Happy Fall and thanks for sharing your lovely home. Kitty, it's all gorgeous and cozy. I love the quilted fabric on your sofa. That's really pretty! Your front door looks great too. Kitty, your home is so beautiful. I can tell it is so loved. From the box your Beloved made you, to the history of each piece of furniture that you redid. 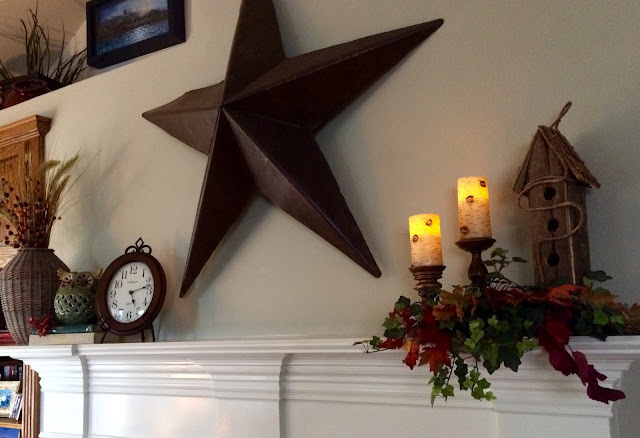 I love all your cute fall pumpkins on the coffee table to the big star over your mantle. Such an inviting and "Kozy" home. Thanks for the tour! Hi Kitty- your fall decorating is warm and inviting. You are so handy with crafts and re-furbishing things. I love that you have that special wood box that your husband made for you. I love the homespun pumpkins in the family room. I'm imagining you dragging the washstand down the alley- great memories! The sofa mink quilt is so neat- and I bet it feels wonderful to wrap up in! I bought a little scarecrow I need to stick in my door basket too, glad I saw yours to remind me! Kitty ... beautiful Fall decorations ... the little guy at the back gate makes me smile. So cute. I scrolled back up to see what else I liked best but too hard to choose because I like it all. The wooden box is special and beautifully decorated. Thanks for sharing your beautiful decorations. Oh Kitty, your home is blooming with Autumn! 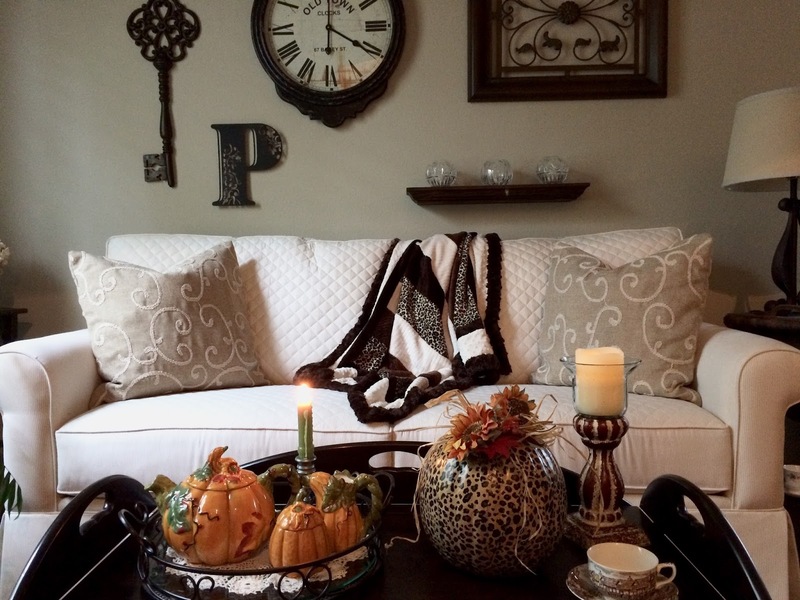 I love all your fall touches, and the minky throw you made for your sofa is fabulous! So many sweet memories, and so many treasured things in your warm and welcoming home, thanks for inviting us in! Your home is so peaceful looking and pretty! The muffins and soup make it even more cozy! I love the door decor with the scarecrow! So cute! We can finally enjoy the outdoors once again! Such a pretty spot to sit and absorb the sounds of nature. Your home is so very pretty, inviting, warm, cozy and filled with perfect Autumn touches. I will most certainly take a bowl of chicken noodle soup! Everything is so charming Kitty! 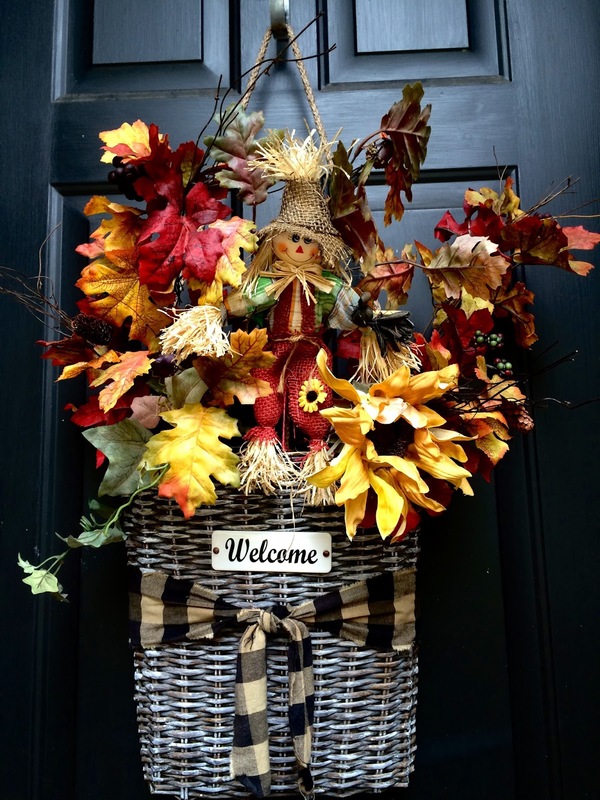 I especially love the adorable fall basket on your front door. Your home radiates your love of home and family. Always a pleasure to visit you!! So beautiful, Kitty. I love your crocheted pumpkin. I think I saved that post wih your directions! And i will definitely take a muffin to go. Enjoy this lovely season. Your home is as comfy and "kozy" as I imagined! I love all of your decorating, the white with the dark wood tones--so lovely! I spied your little white crocheted pumpkin which I love, I have my orange one out that you gave to me a couple of teacup swaps ago. It is a cherished gift from a friend!!! :) I am looking forward to visiting some more of these home tours....just got in from a walk in the woods. It is a beautiful time of year! Enjoy! Kitty, I apologize for my late arrival. I left the house early and just now getting home to the computer. Your home is always welcoming, but have to say the extra fall touches really add yet another layer. I need to make some of those muffins. Love pumpkin breads. Happy Fall! Kitty -your home looks beautiful and you have wonderful fall treasures. I also love reading about your precious memories. Kitty, your home looks so warm and inviting. I love all the fall touches, and how many of them are homemade or gifted. That's what makes a house a home. Especially the box that your dear husband made you. It's perfect to keep on the table and to change out the decor depending on the season. The soup and the muffins look delicious! Kitty you can bake and sew? Baking fantastic at sewing not so much. I admirer people who can sew. That throw you made is the most beautiful I have seen in years no exaggeration. Your tour was wonderful. I so enjoy these tours. Kitty! What a welcoming home you've made! I really love your homemade touches, from dragging the washstand to the furry quilt to the cross stitch to the foods. Oh, to be a guest in your home for even an hour or two. Loved the tour and all your fall decorating!!! The box your beloved made for you is awesome! I really enjoyed all of your wonderful fall touches! I adore your woven teapot! What a neat piece! Kitty, your home looks so cozy and inviting! I love the animal print pumpkin and your minky throw. And yes, please. I'll be happy to take a couple of those muffins! Yum! Happy Fall! What a lovely lovely tour...and super idea. =) Thanks for sharing your comfy cozy home with us. 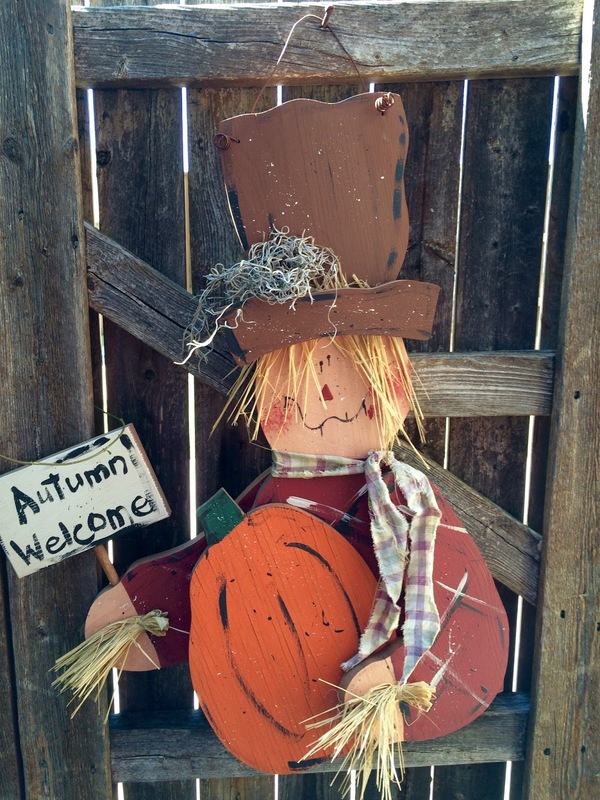 I just love everything about it..your fall decor...your homemade pumpkins are adorable. And your special box is awesome. How precious. Hugs! You have a lovely home that is so cozy and inviting. I love all of your fall decorations. It is so sweet that you the box that your hubby made. Can you share the source of your home spun pumpkins? Hi Chubmoma! You're a No-reply comment blogger and I couldn't email you directly. I made the homespun pumpkins and there's a tutorial on my blog, if you do a search. They are just rectangles of homespun fabric, and then stitched on the bottom and gathered at the top. I made little patches on their fronts, and added buttons, and stuck some twigs on the top, with some leaves and raffia. I'm so glad that you liked them! How beautiful everything looks, Kitty! So warm & welcoming...loved seeing all your projects & treasures. Kitty, your home is lovely. Fall has certainly landed at your house. So sweet to mention my blog. I am happy to hear you found the lovely birch candles, especially on sale. The mantel is so pretty. Your homey touches are seen everywhere. Candy for the Grandkids is so you...a wonderful Nana. Kitty, thanks for the tour at your lovely home. I'll take one of those muffins just as soon as I finish the soup! Your home is so beautiful and welcoming, I felt as though I was really sitting down with you and enjoying a bowl of that delicious chicken noodle soup! Your minky quilt is gorgeous! And I loved all the sweet touches of fall throughout your home, a truly welcoming and relaxing place to visit. Blessings and hugs to you dear friend! I wish I had some of that soup right now! Everything you share makes me hungry ~ :) I love your fall decor and all the treasuYes you've made. The quilt and the animal print pumpkin are favorites! You always feature the sweetest things. I love your DR centerpiece, and also the story of your washstand. The muffins look delicious! Thank you for a tour of your beautiful home, Kitty! I was charmed by your delightful autumn decor. Oh Kitty, I am speechless... Your home is not only beautiful, but just from the pictures I can tell it's a place of warmth and love. Every little detail is inviting and lovely beyond words. Thank you SO MUCH for sharing your home with us. It was truly a blessing to get a peek inside :) Have a blessed Monday, my friend. Much love to you! Love fall at your house ... from the adorable front door to the crochet pumpkin ... very welcoming. I feel like you gave me a hug! Happy Monday! Kitty, What a welcoming fall home tour! You have so many decorative touches that you have made! I'm impressed with your crocheted pumpkin, minky quilt,big star quilt, cross stitch picture plus all the great treats and I'm sure I missed something there was so much to see. Thanks for sharing your home with us. You have a warm and cozy home. I love your fall decor. I would visit for a while because it's so welcoming. 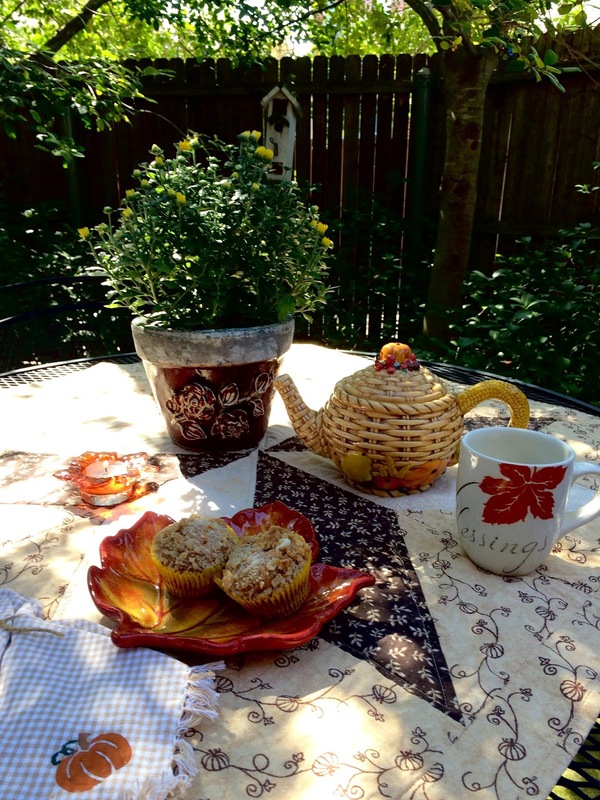 Thank you for sharing your lovely home at Dishing it and Digging it link party. We love having you and hope to see you this coming Sunday. Thank you for the tour, Kitty; I'm sorry I'm so late getting by here. I have only had time to do the minimal amount of blogging recently. I hope to do better very soon! Thank you for sharing this helpful travel post with us.